Abstract: For the monthly spherical harmonic coefficients (SHCs) from GRACE, a method using empirical orthogonal function (EOF) and multi-channel singular spectrum analysis (MSSA) is presented to effectively reduce its dimension and remove its strip noise. 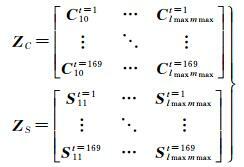 The dynamic changing of the SHCs is analyzed, and the corresponding changing model is then constructed. 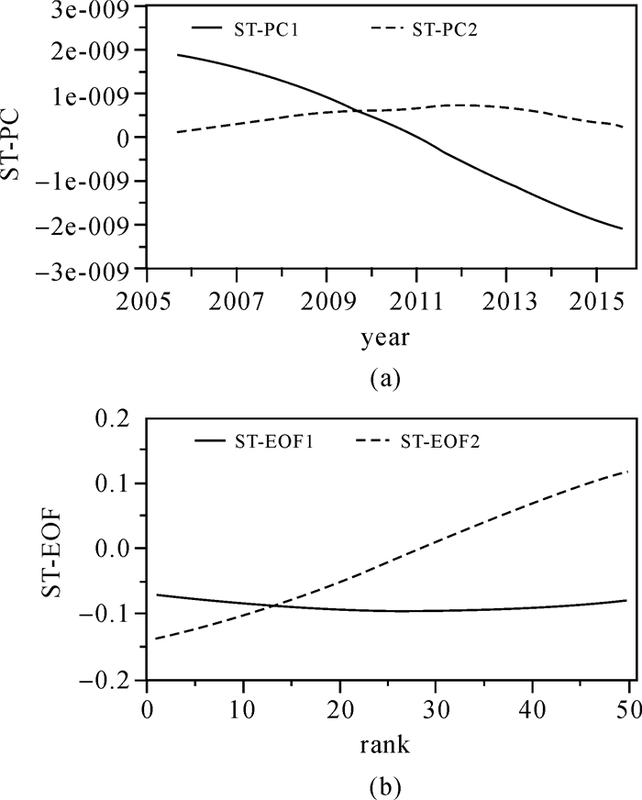 The significant annual term and long term trend have been found in the discrete SHCs, which account for 50.6% and 77.4% (after the annual term has been deducted) of the total variance, respectively. The nonlinear model, which constructed from long term trend and annual term, can perfectly reflect the dynamic changing of the SHCs and its inversion results. And the fitting standard deviation of the equivalent water height on grids over global land areas is between 0.3 cm and 14.0 cm, and the average standard deviation is 1.8 cm. This study can provide valuable implications for the research on the parameter changing characteristics of gravity field and geodynamics. BETTADPUR S. Level-2 Gravity Field Product User Handbook[R]. The GRACE Project. Pasadena, CA: Jet Propulsion Laboratory, 2007. SWENSON S, WAHR J. Post-processing Removal of Correlated Errors in GRACE Data[J]. Geophysical Research Letters, 2006, 33(8): 402–405. 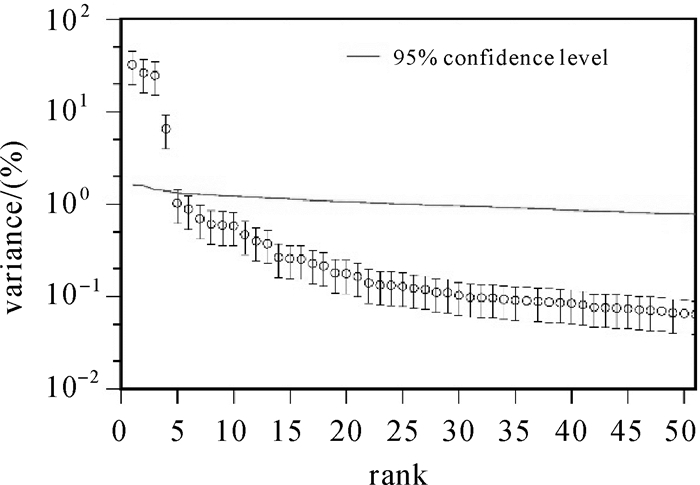 CHEN J L, WILSON C R, TAPLEY B D, et al. 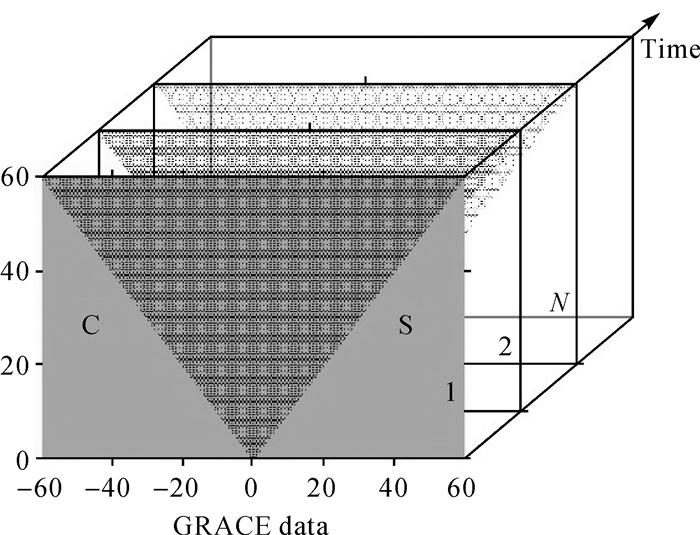 GRACE Detects Coseismic and Postseismic Deformation from the Sumatra-andaman Earthquake[J]. Geophysical Research Letters, 2007, 34(13): 302. 詹金刚, 王勇, 郝晓光. GRACE时变重力位系数误差的改进去相关算法[J]. 测绘学报, 2011, 40(4): 442–446, 453. ZHAN Jingang, WANG Yong, HAO Xiaoguang. Improved Method for Removal of Correlated Errors in GRACE Data[J]. Acta Geodaetica et Cartographica Sinica, 2011, 40(4): 442–446, 453. TAPLEY B D, BETTADPUR S, WATKINS M, et al. The Gravity Recovery and Climate Experiment:Mission Overview and Early Results[J]. Geophysical Research Letters, 2004, 31(9): 4. 罗志才, 李琼, 张坤, 等. 利用GRACE时变重力场反演南极冰盖的质量变化趋势[J]. 中国科学(地球科学), 2012, 42(10): 1590–1596. LUO Zhicai, LI Qiong, ZHANG Kun, et al. Trend of Mass Change in the Antarctic Ice Sheet Recovered from the GRACE Temporal Gravity Field[J]. Science China Earth Sciences, 2012, 42(10): 1590–1596. 杨元德, 鄂栋臣, 晁定波, 等. GRACE估算陆地水储量季节和年际变化[J]. 地球物理学报, 2009, 52(12): 2987–2992. 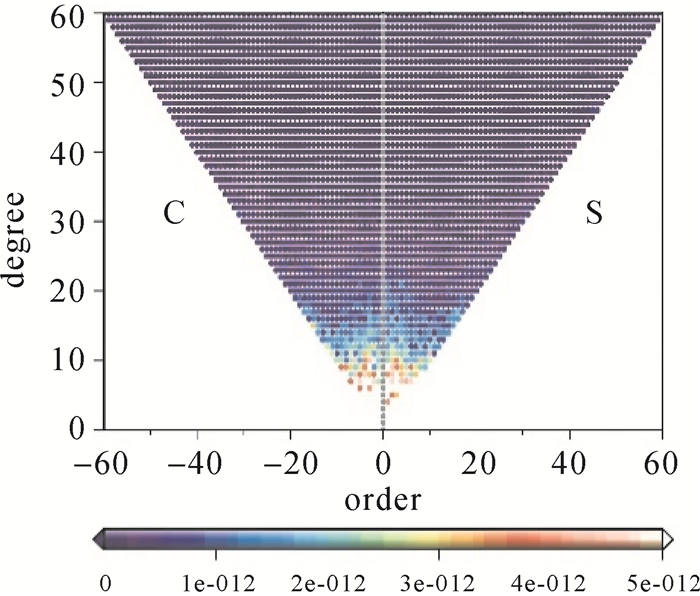 RANGELOVA E, SIDERIS M G, KIM J W. On the Capabilities of the Multi-channel Singular Spectrum Method for Extracting the Main Periodic and Non-periodic Variability from Weekly GRACE data[J]. Journal of Geodynamics, 2012, 54(2): 64–78. 涂弋, 陆洋, 张子占, 等. 利用GRACE资料构造大尺度时变重力场统一模型[J]. 武汉大学学报(信息科学版), 2016, 41(8): 1100–1106, 1112. TU Yi, LU Yang, ZHANG Zizhan, et al. Large-scale Time-variable Unified Gravity Field Model Using GRACE Data[J]. Geomatics and Information Science of Wuhan University, 2016, 41(8): 1100–1106, 1112. KUSCHE J, EICKER A, FOROOTAN E. Analysis Tools for GRACE and Related Data Sets, Theoretical Basis[R]. Technichal Report, Mayschoss, Germany: [s.n. ], 2011. FOROOTAN E. Statistical Signal Decomposition Techniques for Analyzing Time-variable Satellite Gravimetry Data[D]. Bonn: University of Bonn, 2014. WOUTERS B, SCHRAMA E J O. 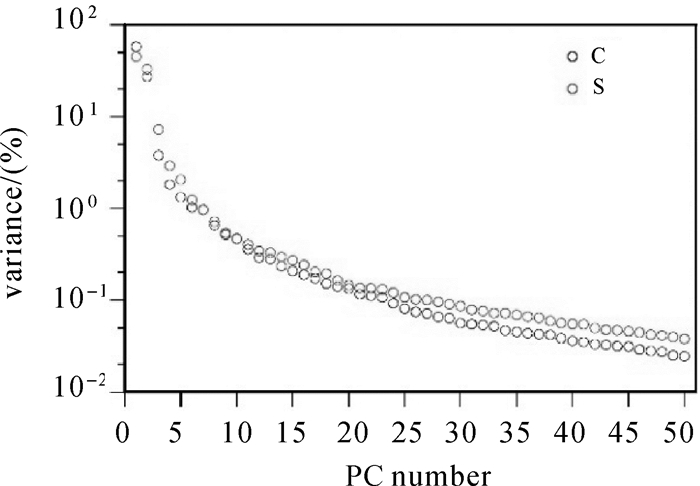 Improved Accuracy of GRACE Gravity Solutions through Empirical Orthogonal Function Filtering of Spherical Harmonics[J]. Geophysical Research Letters, 2007, 34(23): 229–241. SCHRAMA E J O, WOUTERS B, LAVALLÉE D A. Signal and Noise in Gravity Recovery and Climate Experiment (GRACE) Observed Surface Mass Variations[J]. Journal of Geophysical Research:Solid Earth, 2007, 112(B8): 407. RANGELOVA E, VAN DER WAL W, BRAUN A, et al. 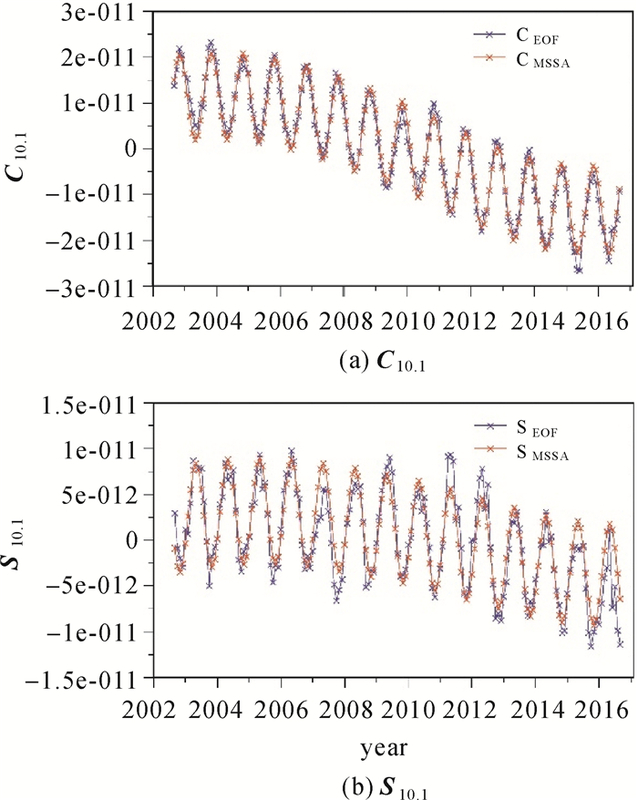 Analysis of Gravity Recovery and Climate Experiment Time-variable Mass Redistribution Signals over North America by Means of Principal Component Analysis[J]. Journal of Geophysical Research, 2007, 112(F3): F03002. RIETBROEK R. Retrieval of Sea Level and Surface Loading Variations from Geodetic Observations and Model Simulations: An Integrated Approach[D]. Bonn: University of Bonn, 2014. 文汉江, 黄振威, 王友雷, 等. 青藏高原及其周边地区水储量变化的独立成分分析[J]. 测绘学报, 2016, 45(1): 9–15. 吴洪宝, 吴蕾. 气候变率诊断和预测方法[M]. 北京: 气象出版社, 2010. WU Hongbao, WU Lei. Methods for Diagnosing and Forecasting Climate Variability[M]. Beijing: China Meteorological Press, 2010. ZOTOV L, SHUM C K. Multichannel Singular Spectrum Analysis of the Gravity Field Data from GRACE Satellites[C]//AIP Conference Proceedings.[S.l. ]: AIP, 2010(1206): 473-479. 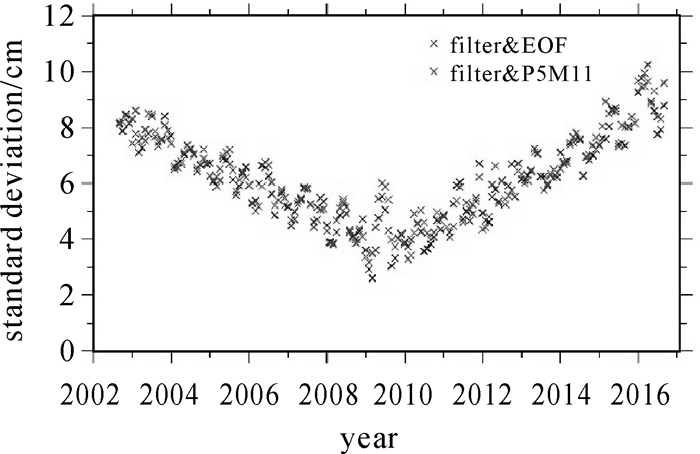 CHENG Minkang, TAPLEY B D. Variations in the Earth's Oblateness During the Past 28 Years[J]. Journal of Geophysical Research:Solid Earth, 2004, 109(B9): B09402. 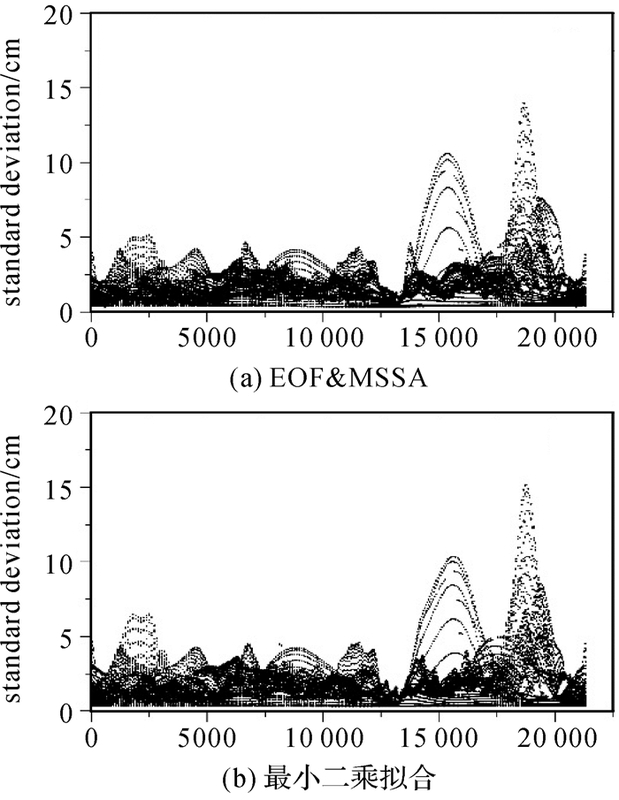 SWENSON S, CHAMBERS D, WAHR J. Estimating Geocenter Variations from a Combination of GRACE and Ocean Model Output[J]. Journal of Geophysical Research:Solid Earth, 2008, 113(B8): B08410. 胡小工, 陈剑利, 周永宏, 等. 利用GRACE空间重力测量监测长江流域水储量的季节性变化[J]. 中国科学D辑:地球科学, 2006, 54(9): 483–491. HU Xiaogong, CHEN Jianli, ZHOU Yonghong, et al. 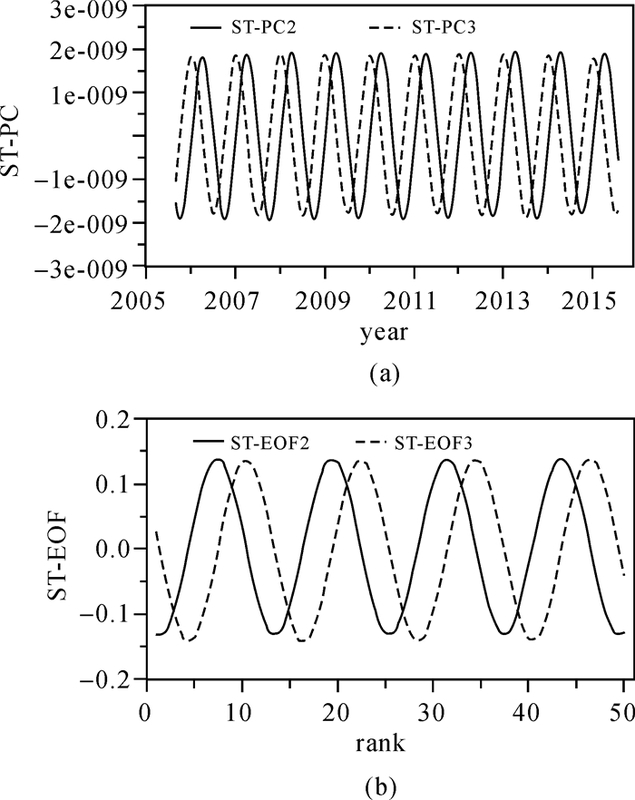 Seasonal Water Storage Change of the Yangtze River Basin Detected by GRACE[J]. Science in China Series D:Earth Sciences, 2006, 54(9): 483–491. 钟敏, 段建宾, 许厚泽, 等. 利用卫星重力观测研究近5年中国陆地水量中长空间尺度的变化趋势[J]. 科学通报, 2009, 54(9): 1290–1294. ZHONG Min, DUAN Jianbin, XU Houze, et al. 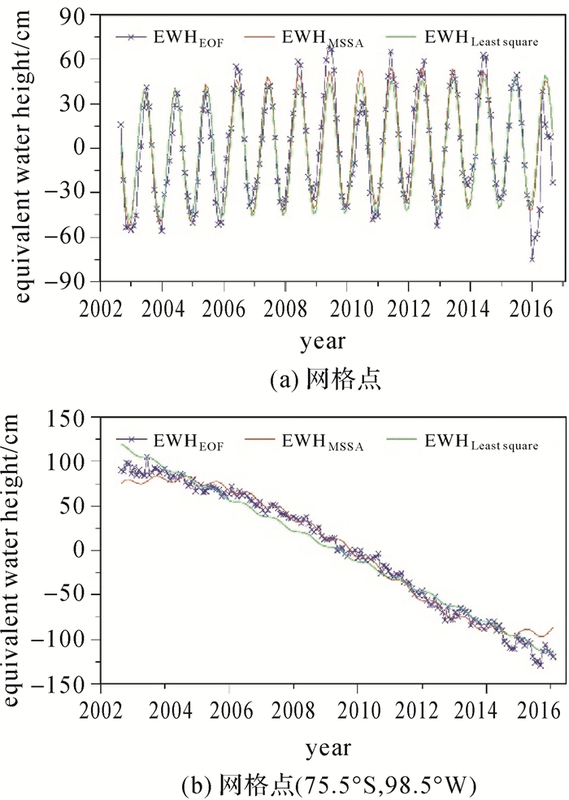 Trend of China Land Water Storage Redistribution at Medi-and Large-spatial Scales in Recent Five Years by Satellite Gravity Observations[J]. Chinese Science Bulletin, 2009, 54(9): 1290–1294. 鄂栋臣, 杨元德, 晁定波. 基于GRACE资料研究南极冰盖消减对海平面的影响[J]. 地球物理学报, 2009, 52(9): 2222–2228. 贾路路, 汪汉胜, 相龙伟. 利用GRACE、GPS和绝对重力数据监测斯堪的纳维亚陆地水储量变化[J]. 测绘学报, 2017, 46(2): 170–178. PHILLIPS T, NEREM R S, FOX-KEMPER B, et al. 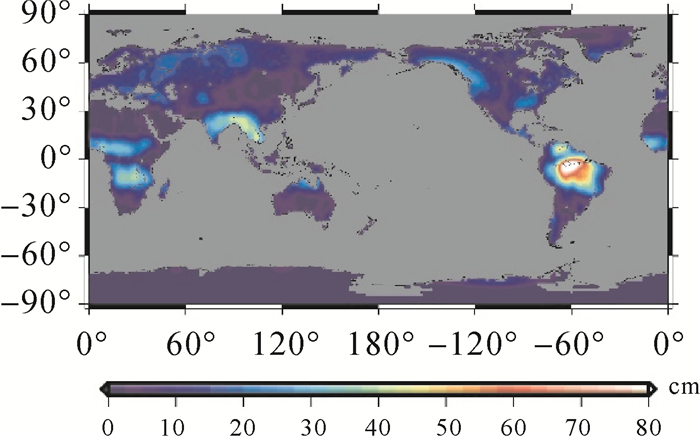 The Influence of ENSO on Global Terrestrial Water Storage Using GRACE[J]. Geophysical Research Letters, 2012, 39(16): L16705. CHEN J L, WILSON C R, TAPLEY B D. The 2009 Exceptional Amazon Flood and Interannual Terrestrial Water Storage Change Observed by GRACE[J]. Water Resources Research, 2010, 46(12): W12526. 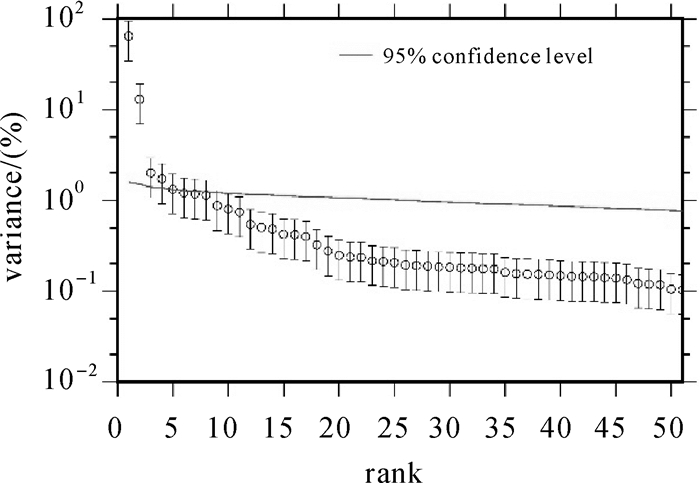 CHEN J L, WILSON C R, TAPLEY B D, et al. 2005 Drought Event in the Amazon River Basin as Measured by GRACE and Estimated by Climate Models[J]. Journal of Geophysical Research:Solid Earth, 2009, 114(B5): B05404.